Puromycin is an aminonucleoside antibiotic. It is produced naturally by the Streptomyces alboniger bacterium and disrupts peptide transfer on ribosomes causing premature chain termination of protein synthesis. It is a powerful inhibitor of translation in both prokaryotic and eukaryotic cells. Resistance to puromycin is conferred by the puromycin N-acetyl-transferase gene (pac), also from Streptomyces. The pac gene is readily included into plasmids and provides a simple selectable marker, most commonly used in mammalian cells and yeast. For isolation of puromycin-resistant mammalian cells, preliminary experiments should be conducted to select the optimum puromycin concentration, typically 1-10 µg/ml, depending on the cells used. Following transfection (24-48h) incubate cells in fresh medium containing Puromycin at the appropriate concentration. The selection process will work best if cells are actively dividing, and not confluent. Remove and replace the puromycin-containing medium every 3-4 days. Examine cells for the formation of foci after 7 days of selection. Formation of foci may require several additional days to develop depending on the host cell line and transfection/selection efficiency. Transfer and pool resistant clones to a fresh cell culture plate and maintain on selection medium for another week. This pooled culture provides the source of resistant cells. Oxford Genetics provides a broad range of plasmids containing puromycin resistance in a variety of configurations to meet all of your cloning requirements. The plasmid structure shown contains puromycin resistance driven by the ubiquitin promoter, with kanamycin for bacterial selection. 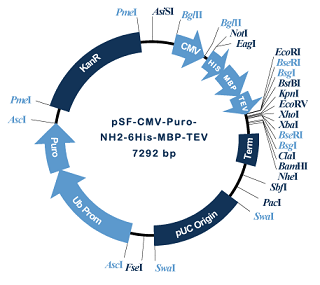 The CMV promoter drives expression of any gene inserted into the MCS, and this plasmid also provides N terminal histidine and maltose binding protein tags, together with a TEV protease cleavage site to allow removal of both tags, if required, following protein production. Our Plasmid Builder facility also provides a simple means for you to design an efficient strategy for any modifications or cloning manipulations to these plasmids. Finally, as always, although we have designed these plasmids for simple and efficient cloning, we are happy to undertake any cloning steps that you prefer to outsource. You can access all these options through the button below. Hygromycin B is an aminoglycoside antibiotic isolated from Streptomyces hygroscopicus. It disrupts translation by interfering with translocation and causes mistranslation at the 70S ribosome. Hygromycin B kills most bacteria, fungi and higher eukaryotes. Hygromycin B is normally used at concentrations of 50-200 µg/ml in eukaryotic cells. The 1 kb hph gene is readily include into plasmids and provides a simple selectable marker, most commonly used in mammalian cells and yeast. For isolation of hygromycin-resistant mammalian cells, preliminary experiments should be conducted to select the optimum hygromycin concentration, typically 50-200 µg/ml, depending on the cells used. Following transfection (24-48h) incubate cells in fresh medium containing hygromycin at the appropriate concentration. The selection process will work best if cells are actively dividing, and not confluent. Remove and replace the hygromycin-containing medium every 3-4 days. Oxford Genetics provides a broad range of plasmids containing hygromycin resistance in a variety of configurations. Please see our online catalogue, accessed via the buttons below. 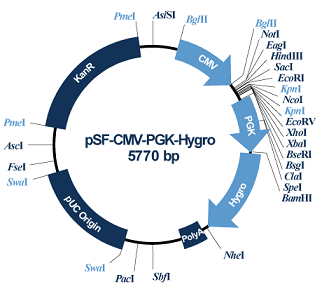 The plasmid structure shown contains hygromycin resistance driven by the PGK promoter, with the MCS promoter positioned to drive your gene of interest (inserted into the MCS). Blasticidin is a nucleoside antibiotic produced by the bacterium Streptomyces griseochromogenes. It is a powerful inhibitor of translation in both prokaryotic and eukaryotic cells. Resistance is conferred by the bsd gene from Aspergillus terreus. Blasticidin acts quickly and causes cell death at low concentrations. E. coli strains are generally killed by concentrations of 50 µg/ml, while mammalian cells are killed by concentrations as low as 2 to 10 µg/ml. The 393 bp bsd gene encodes a polypeptide of 130 amino ac ids. It is readily included into plasmids and provides a simple selectable marker, most commonly used in mammalian cells and yeast. For isolation of blasticidin-resistant mammalian cells, preliminary experiments should be conducted to select the optimum blasticidin concentration, typically 2-20 µg/ml, depending on the cells used. Following transfection (24-48h) incubate cells in fresh medium containing blasticidin at the appropriate concentration. The selection process will work best if cells are actively dividing, and not confluent. Remove and replace the blasticidin-containing medium every 3-4 days. Oxford Genetics provides a broad range of plasmids containing blasticidin resistance in a variety of configurations. 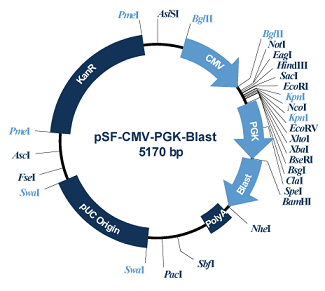 The structure shown contains blasticidin resistance under control of the PGK promoter, allowing you to insert your gene of interest into the MCS under control of the CMV promoter. 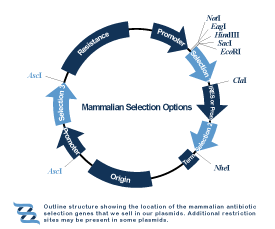 The plasmid also provides kanamycin resistance for selection in bacteria. Many diverse plasmids are available from our online catalogue, see buttons below. Zeocin is a copper chelated glycopeptide antibiotic related to bleomycin and causes cell death by intercalating into DNA and cleaving it. It is very toxic to a range of organisms, including mammalian and insect cells, as well as yeast, bacteria, and plants. Resistance to Zeocin™ is conferred by the Sh ble gene, which binds and prevents it from interacting with DNA. The broad applicability of Zeocin resistance means that a single selectable marker can be used for several different cell types. E. coli strains are generally killed by concentrations of 25 µg/ml, while mammalian cells are killed by concentrations 50 - 400 µg/ml. The 370 bp Sh ble gene is readily included into plasmids and provides a simple selectable marker, for many different cell types. For isolation of Zeocin-resistant mammalian cells, preliminary experiments should be conducted to select the optimum Zeocin concentration, typically 25 - 400 µg/ml, depending on the cells used. Following transfection (24-48h) incubate cells in fresh medium containing Zeocin at the appropriate concentration. The selection process will work best if cells are actively dividing, and not confluent. Remove and replace the Zeocin-containing medium every 3-4 days. Oxford Genetics provides a broad range of plasmids containing Zeocin resistance in a variety of configurations. 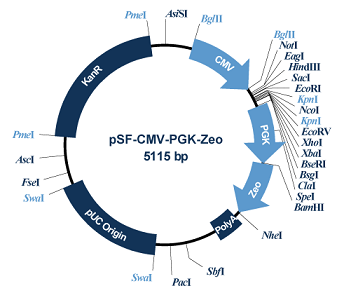 The plasmid structure shown provides the Zeocin gene under regulatory control of the PGK promoter, with the CMV promoter available to drive expression of your gene of interest inserted into the MCS.